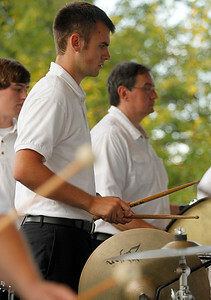 Matthew Apgar - mapgar@shawmedia.com Percussionists (from left:) Evan Berg, Anthony DeMartinis, and Wenzel Roessler perform with the Woodstock City Band on Wednesday, July 22, 2015 in Woodstock. 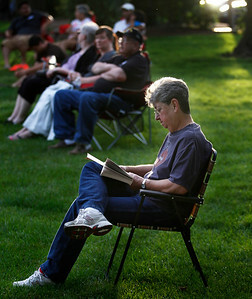 Matthew Apgar - mapgar@shawmedia.com Evelyn Jahn of Woodstock enjoys a book at Woodstock Square while awaiting a performance by Woodstock's City Band on Wednesday, July 22, 2015 in Woodstock. 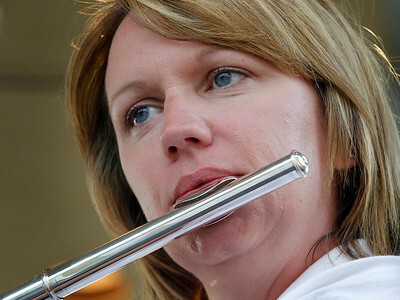 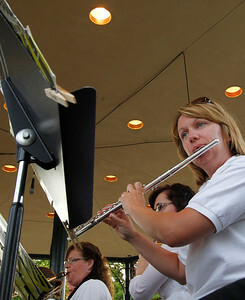 Matthew Apgar - mapgar@shawmedia.com Britt Crowe plays on the flute during a performance by the Woodstock City Band on Wednesday, July 22, 2015 at the Woodstock Square in Woodstock. 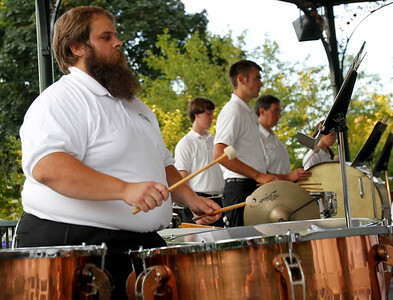 Matthew Apgar - mapgar@shawmedia.com Percussionists (from left:) Scott Hettinga, Evan Berg, Anthony DeMartinis, and Wenzel Roessler perform with the Woodstock City Band on Wednesday, July 22, 2015 in Woodstock. 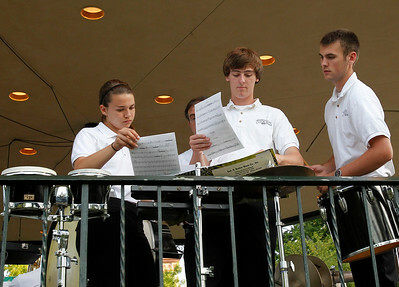 Matthew Apgar - mapgar@shawmedia.com Percussionists (from left:) Katie Holub, Wenzel Roessler, Even Berg, and Anthony DeMartinis select their music sheets during a performance by the Woodstock City Band on Wednesday, July 22, 2015 in Woodstock. 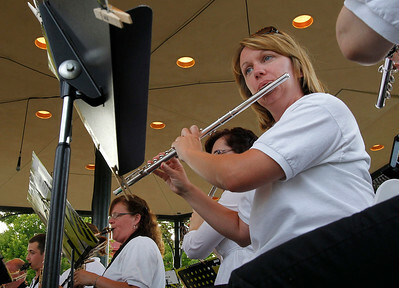 Matthew Apgar - mapgar@shawmedia.com People gather at Woodstock Square for a performance by Woodstock's City Band on Wednesday, July 22, 2015 in Woodstock. 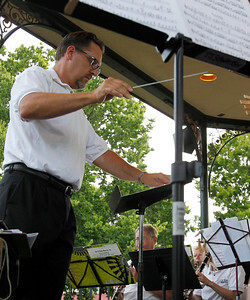 Matthew Apgar - mapgar@shawmedia.com Woodstock City Band conductor Duane Peiffer sets the tempo on Wednesday, July 22, 2015 in Woodstock. 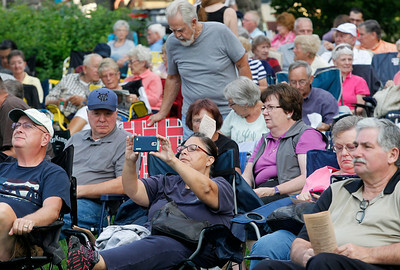 Matthew Apgar - mapgar@shawmedia.com Judy and Ray Thornton of Marengo mimic postures as they share a moment on a park bench at Woodstock Square while waiting for a performance by Woodstock's City Band on Wednesday, July 22, 2015 in Woodstock. 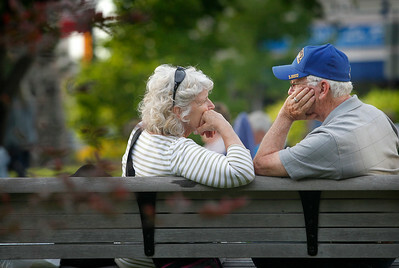 Judy and Ray Thornton of Marengo mimic postures as they share a moment on a park bench at Woodstock Square while waiting for a performance by Woodstock's City Band on Wednesday, July 22, 2015 in Woodstock.